Song birds in pine trees - cardinals, chickadees, blue jays ! Great boxed bottom on the bag helps it sit up easily. I added a decorative red machine embroidery trim at the very top. The inside lining is a coordinating solid blue color. The inside lining matches the outside drawstring pocket. Drawstring is a mix of various yarns that coordinate with the colors of the bag - all yarns are braided into a rope. 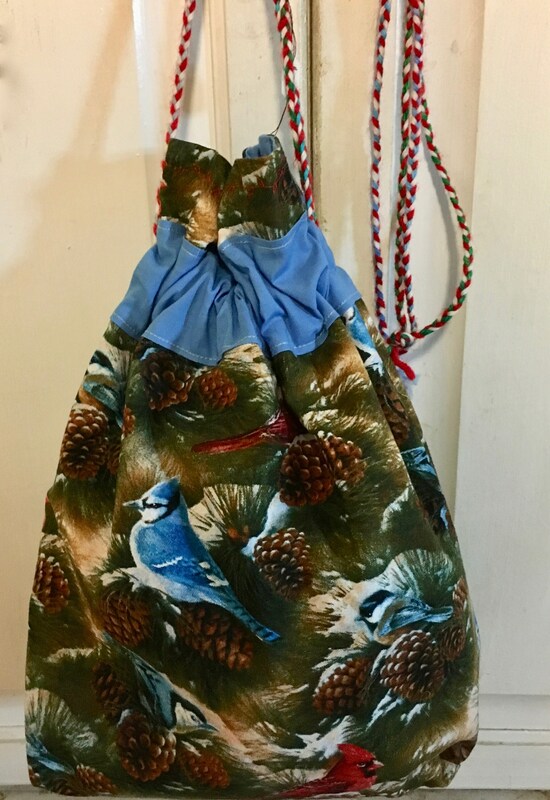 This bag measures approximately 12-1/4" x 9-3/4" - it is 100% cotton and it is machine washable, gentle cycle please with like colors, turn inside out to protect the drawstring or hand wash!